The cricket season is rapidly approaching, so it is time to start thinking about Colts coaching sessions on The Green at Reed. But first there will be a Colts’ Presentation and Enrolment Evening in the Pavilion on Thursday 26th March at 7.30 p.m. with awards, reports and presentations to last season’s outstanding players. Club Chairman, John Heslam will be the Guest Presenter. All existing Colts are welcome, as well as new ones. 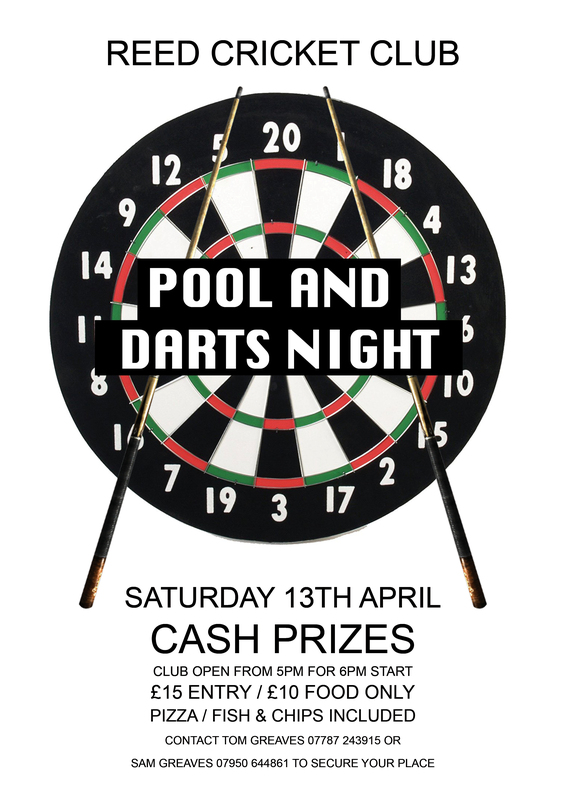 If you have any friends, boys or girls, who might be interested, bring them along to the evening. If you were awarded a trophy last year, please return it to Cilla Robertson by Saturday 28th February for engraving. Caps and cricket equipment, including Abdo guards will be on display to order or purchase. If you are selected to play in a match, you are expected to wear full whites and a Reed Cricket Club cap. In addition, you will need your own Abdo guard, clearly named as with any other personal equipment. All players, who do not have their own helmet, are measured at the start of the season, so that you and your manager ensure that you wear the correct helmet when batting and / or wicket keeping. The continued success of Reed’s four Senior XIs in the Hertfordshire Premier League means that coaches and the facilities are unavailable for running Colts’ practices on Saturday mornings. Therefore, we shall continue with coaching on Sunday mornings during 2015. The first session for the U11s and U13s starts on SUNDAY 26th APRIL from 10.00 a.m. to 12.00 p.m. and continues until Sunday 19th July. The first session for U15s and U16s is on FRIDAY 24th APRIL from 6.00 p.m. to 8.00 p.m. until Friday 17th July. The U11s, U13s and U15s will be playing in the mid-week Cambridgeshire Leagues. 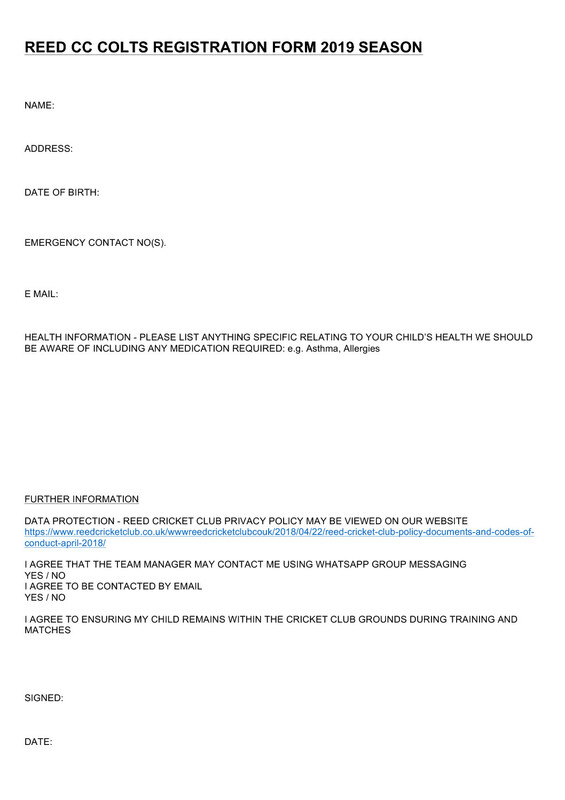 U16s and those U15s with appropriate playing skills and ability will also be eligible for selection for the Senior Reed CC Teams on Saturday and Sunday afternoons which have fixtures from April through to September. A fixture list will be available at the Presentation Evening. Selection for matches depends on commitment to training sessions – the Colts’ season is short, but intensive. Mrs L. Robertson, Reed C.C. Welfare Officer, 1, Rose Villas, Jackson Lane, Reed, Royston, SG8 8AB. Tel: 01763 848835. We hope to welcome as many of last season’s Colts and their parents as well as new members on Thursday 26th March. 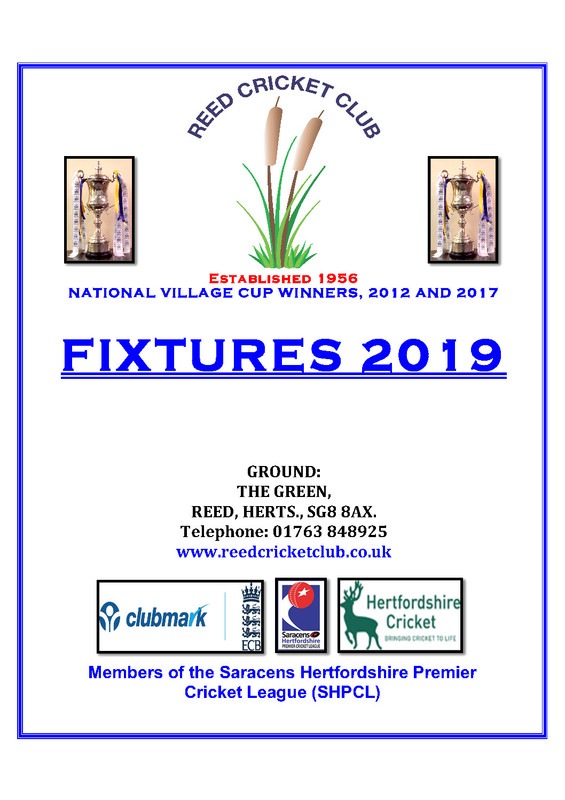 On behalf of Reed Cricket Club, the team managers and coaches, I wish you all an enjoyable season and look forward to seeing you on Sunday mornings or Friday evenings.